The euro to dollar finally found some traction yesterday in the USD1.3460 region following Tuesday’s doji candle which hinted at a possible pause and bounce higher for the pair. It was therefore no surprise to see the euro to dollar rise in today’s trading session as recent fears over an Irish default subsided and the EU project appears to be back on track. 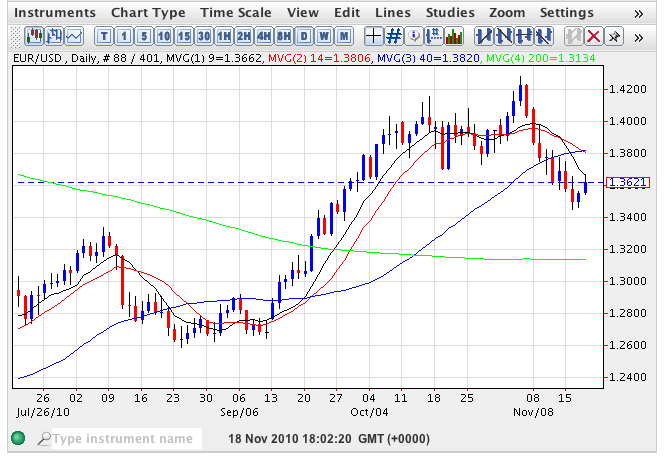 However, from a technical perspective the short term picture remains weak with today’s high running into resistance from the 9 day moving average at USD1.3661 with the euro to dollar trading below this at time of writing. The bearish picture is further reinforced by the 14 day average which is now crossing below the 40 adding a bear cross signal. However, with the Irish problem now “resolved” and any concerns over China now temporarily forgotten we can expect to see the US FED policy bear down on the US dollar and begin to bear down on the US dollar once again. Indeed today’s fundamental news in the US confirmed that jobless claims rose last week to 439k, an increase of 2k on the previous week, a worrying sign that the US economy still has a considerable way to go and confirming that the FED will start its QE2 policy very soon. Furthermore, core consumer prices in the US are continuing to rise at their slowest pace since records began adding further weight to the FED’s decision. As such we can expect to see the euro to dollar continue to recover, climb back above USD1.4 and thereafter move beyond the USD1.4282 high of early November in due course.